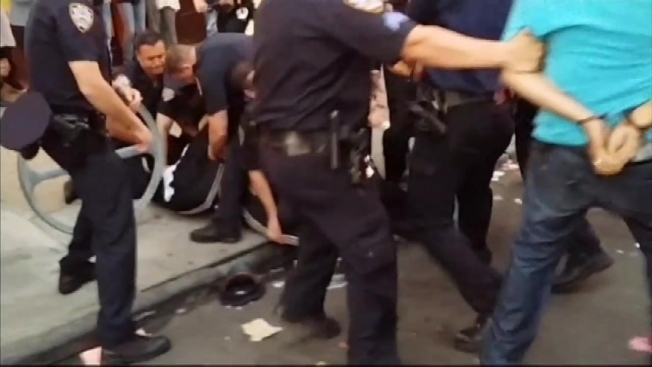 An NYPD officer has been suspended after video surfaced of a street fair altercation in Brooklyn showing him apparently kicking a man on the ground. Police Commissioner Bill Bratton said Wednesday the officer has been stripped of his gun, badge and police duties while the department investigates. The man on the receiving end of the kick, Jonathan Daza, told NBC 4 New York he was cleaning up his fruit stand when a confrontation with police quickly spiraled out of control. "They shouldn't be like that. It's not like I was armed. I didn't have nothing on me," he said. The video surfaced following the street fair last weekend after several people shot the incident on their cellphones. Bratton said the fair was supposed to end at 6 p.m. but it was still going a half hour later. Officers tried to clear the street for traffic. The amateur video shows officers arresting Daza, who was wearing a black and white jacket. Another officer comes up and appears to kick him in the side, then walks away. Daza told NBC 4 New York he and his two sisters were selling fruit at the fair and cleaning up the stand when police yelled at them to move faster, he said. The altercation quickly led to a scuffle and Daza claims police choked him. "There was a certain point where I couldn't breathe, and I said 'I can't breathe,' and they kept hitting me," he said. Bratton says the department is taking the altercation very seriously. He also said he'll be meeting with community leaders in Sunset Park to discuss community-police relations. Daza, his two sisters and two other people were arrested on an array of charges, including disorderly conduct, resisting arrest and harassment. One of the other people arrested, Edwin Morales, said he was only trying to get his daughter to safety and wasn't resisting arrest or being violent. "All of a sudden, I was getting punched on and they threw me up against the van, cuffed me and took me to the precinct," he said. One of the bystanders who shot video, Eduardo Semidey, said the kick was "very uncalled for. The whole incident was uncalled for, could have been prevented. It was very preventable."